Yeah, and Dion knows that. That’s a tough play to make. I think that our support was a long ways away, as well. If we get a little bit closer support – it doesn’t allow for that much time. Phaneuf played hard. He had a big hit in the first period that got us going in the game. That one was probably one he’d like to have back, though. It was good to see we got one on the power play. We had a chance at the end. I think our power play’s going to come back and give us some stuff. I feel confident in that. But that was a game, we played OK. I think our battle level was OK, but we weren’t at the level we needed to get the win. I think it’s a great experience with him. That’s one of the positives things – when you get injuries, some young guys get ice time that you wouldn’t give them normally. For him, it gives him a chance to prove he can play back-to-back. I think we’re going to have some help on that front pretty quick. Quick will be back fairly soon. But, Cal played well again today. I think that’s good for us when our young guys are playing well. He was good again tonight, eh? I made that change, and right off that he scored, so it was good to see. He’s a good young player. He’s got some size and some speed and he made a great move on that goal. I think it’s a lot of things. I think it’s not putting together a full hockey game. I think it’s little things. I think it’s supporting each other all over the ice. I think it’s about detail, about making plays. It’s about special teams and they haven’t been good enough for us lately. It’s a lot of things. I thought we had a good start, but it’s not always how you start in this league, it’s how you finish and it wasn’t good enough. I don’t think it’s wasted. I don’t think that’s the right term. I think those guys are doing their job. Any time you have young guys coming in and stepping up, that’s good for the hockey club regardless. The rest of us have got to follow suit. I thought he looked really good. Obviously that was a really good move. He’s got a couple really good shots and a couple good goals. I think just using my linemates well. I mean, both their defense started with the low wall and Hags got it and and I just kind of burst out of the zone and he made a nice saucer pass to me and so I just threw a fake in. That’s what they tell us before the game, about the different goalies, and that was part of it so it worked out, tied the game, but kind of got to get the next goal and play with a lead. It definitely felt good and I think coming from the other game it was just, I didn’t feel like I felt bad or anything, I think we just fell on the wrong side of a couple plays. But I thought we put forward a really strong effort and I think the pucks just kinda didn’t bounce our way and they took advantage of the opportunities that they got, but sooner or later those chips are going to fall on our side. I thought it was a huge improvement especially from last game. I mean I think we played well and it was too bad we couldn’t take advantage of a team coming off of a back-to-back, but I think with them they just took advantage of their opportunities, but we really didn’t give them all that much so I think from a defensive side it was really just all a hockey game. –With the loss, Los Angeles fell to 110-105-36 all-time against Vancouver, a record that includes a home mar of 67-43-18. 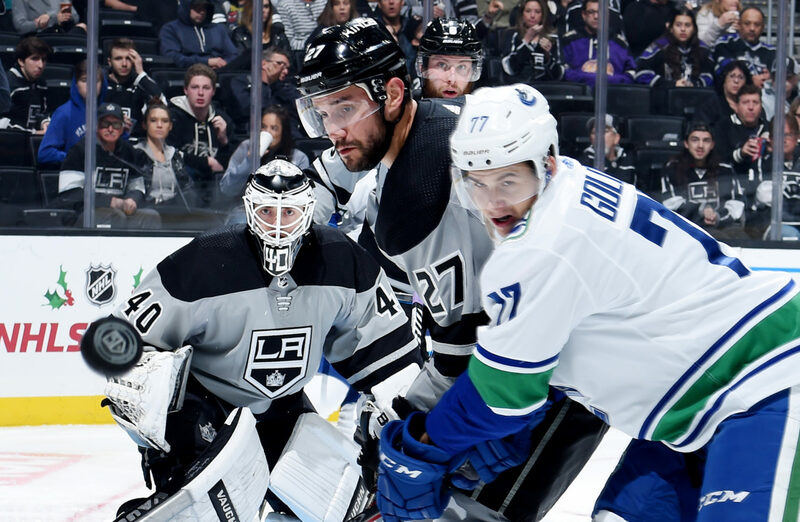 The Canucks are 3-1-1 in their last five visits to Staples Center. These teams have three games remaining: November 27 and March 28 at Rogers Arena and February 14 at Staples Center. –With the loss, the Kings fell to 3-8-1 against the Western Conference, 1-2-1 against the Pacific Division, 2-4 in two-goal games, 1-12-1 when their opponent scores first, 3-5-0 when tied after the first period, 1-1-1 when tied after the second period and 5-8-1 when out-shot by their opponent. –Los Angeles has lost five straight home games in regulation. Their last five-game home losing streak took place between January 4 and January 18, 2018 (0-4-1). The Kings had two 0-4-1 home stretches in the 2017-18 season. The last five-game home losing streak in which all losses came in regulation was between March 16 and April 2, 2004 (0-6-0). –Matt Luff extended his goal streak to three games, marking the longest goal streak by a King this season. — Ilya Kovalchuk was held without a point for the eighth consecutive game. –By recording an assist on Luff’s goal, Adrian Kempe now has six assists in seven career games against Vancouver. He has four points (1-3=4) and a plus-three rating in his last six games. –Los Angeles attempted 56 shots (22 on goal, 16 blocked, 18 missed). Vancouver attempted 48 shots (29 on goal, 8 blocked, 11 missed). Bo Horvat and Austin Wagner tied with a game-high four shots on goal. –The Kings won 28-of-47 faceoffs (60%). Adrian Kempe won 4-of-7, Anze Kopitar won 10-of-15, Ilya Kovalchuk won 0-of-1, Nate Thompson won 4-of-9, Matt Luff won 1-of-1 and Jeff Carter won 9-of-14. The Kings are not scheduled to hold a morning skate at Toyota Sports Center Sunday morning in advance of their game against the Edmonton Oilers.